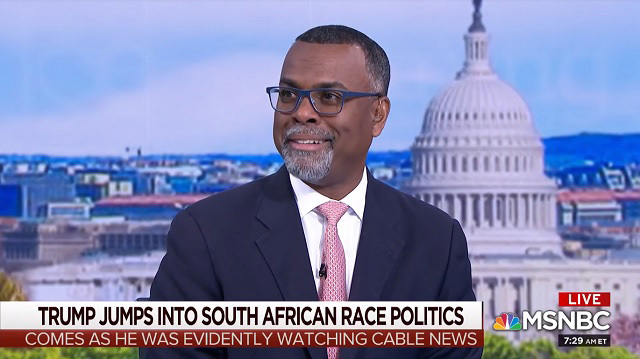 "I think two of them, perhaps, might have been killed in some instance..."
MSNBC's Eddie Glaude laughed about the murder of white farmers in South Africa on Morning Joe Thursday and said he thinks "two of them, perhaps, might have been killed in some instance." Speaking of Trump tweeting about the "large scale killing" of white farmers and the seizing of their lands in South Africa, Glaude said, "In this instance, [Trump's] really trafficking in conspiracy theories to kind of in some ways feed red meat to his base." "This is nonsense, it's silly," Glaude said, "but it's consistent with the kind of cultural warrior that he is." "Because, at the same time that he's doing this with regards to South African white farmers -- I think two of them, perhaps, might have been killed in some instance," Glaude said while bursting out laughing, "with the majority of folks who have been subject to any kind of violence and this is non-white farmers in this instance." "He's also, shall we say, playing the card with regards to the Mollie Tibbetts murder, this horrific murder in Iowa," he said. "He's saying that this is the result of not having the wall. Here, this is a morally debased man who will do anything to protect himself and to divert attention from the fact that he has been noted as a non-indicted co-conspirator in a felony," Glaude said. "So, this is just an example of how bad he is as a human being," he said. According to Transvaal Agricultural Union data, in the 2016/17 reporting period there were 74 murders of farmers recorded overall with 55 being "clearly of white farmers or family members" and 51 being white farmers alone. Stats are underreported because South Africa is a Third World country. The entire segment was full of similar fake news and fake history, none of which will be "fact-checked" by the establishment's so-called "fact-checkers" and none of which will result in MSNBC or anyone involved being censored on social media.